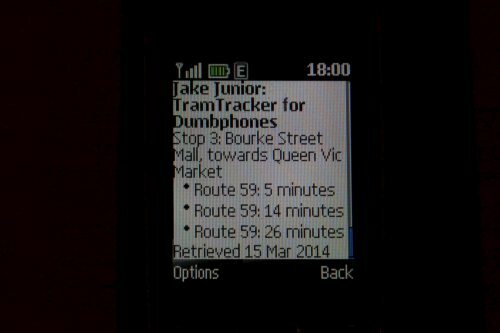 Over the years I’ve been using TramTracker on my ancient Nokia mobile phone, until December 2013 when Yarra Trams updated the web version of the service, and rendered it unusable on older devices. Unlike other public transport operators, Yarra Trams actually took my feedback on board and released an updated web version of TramTracker a month later, but unfortunately for me, they were not enough to make it work with my ancient WAP only phone. As a result, I took inspiration from my recent experiments with PTV’s new API, and came up with a simple website to give access to TramTracker data. Called ‘Jake Junior: TramTracker for Dumbphones’, you can give it a go at http://jakejunior.wongm.com/. TramTracker first appeared in Melbourne way back in December 2006, with only two ways of accessing tram arrival information: voice or SMS reply. However usage of the service didn’t take off until 2009, when an incredibly well designed iPhone app was released, providing a much more convenient way to find tram stops and arrival times. Since then additional methods of access have been provided – a mobile friendly website for non-iPhone devices, a ‘webPID’ for desktop computers in 2009, and an Android app in October 2012. Third-party developers have also built their own apps for the TramTracker service – the most interesting one I’ve found so far is TramFinder for Pebble watches! One thing these third-party apps have in common is their source of tram arrival data – a public API found at http://ws.tramtracker.com.au/pidsservice/pids.asmx. This API isn’t the easiest thing to play around with because it follows the SOAP specification for webservices – a horrible tarball of XML requests being sent back and forth between devices. @aussiewongm @petehare they’re on the same infrastructure so it shouldn’t matter so much. With that in mind, I spent a few hours cobbling together some PHP code, with ‘Jake Junior’ being the end result. Internally ‘Jake Junior’ is just a single PHP file – you can find the source code at https://github.com/wongm/jake-junior. Stop information and tram arrival times are retrieved using two hits to the TramTracker API: unfortunately it doesn’t combine the two types of data into a single method. By the way – TramTracker ID 1234 is on route 1 in South Melbourne! Once I had the results of the two API calls as a JSON string, I was able to deserialise the data, do some simple maths to convert the JSON timestamp into a minutes until arrival figure, and then output it all as HTML. You can play around with the end result at http://jakejunior.wongm.com. If you are wondering about the ‘Jake Junior’ name – the official TramTracker mascot is dog named Jake. And Jake was the name of former CEO Dennis Cliche’s dog. I must make mention of the fast and simple Tram Hunter for android phones. While I have Tram Tracker for android, Tram Hunter is simpler and faster. I find the estimated arrival times of trams along the 19, 57 and 59 route to be unreliable. For example, often during peak times it will say that the next tram is 2 minutes away, then it suddenly becomes 8 minutes away, 14 minutes away, before the tram turns up 5 minutes later. I thnk there is a blackspot in the tram monitoring system through Royal Park – in my experience arrival times for citybound trams on route 55 at the Royal Children’s Hospital jump around all over the place. You’re right about the learning curve for Jake Junior being a bit steep – unlike the ‘proper’ TramTracker apps you have to manually enter your tram stop ID, but given the capabilities of a low end device, there is not much one can do. Good post; I’m planning on integrating this into my own personal timetable web site (http://tt.joelbuckley.com.au/). Just wondering how you went about getting a Dev-ID for the JSON API for TramTracker? Their website seems to suggest I need ‘aid’ (Auth ID) and ‘devInfo’. Would the ‘aid’ and ‘devInfo’ values be the ones required by this version of the REST API? If so, I haven’t used that API myself, so can’t help on that front.